Chunt's house gets pretty full when Arnie and Usidore are visited by Arnor and the Soul Walker. 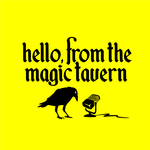 Listen to season 2 of Hello from the Magic Tavern Presents: Offices and Bosses only on Stitcher Premium. For a free month of listening, go to stitcherpremium.com/magic [stitcherpremium.com] and use promo code 'MAGIC'. This was a lot of fun. Arnor and the Soul Walker are good characters to throw in every now and then, and the combination worked superbly, thanks to Swen and Bryant.